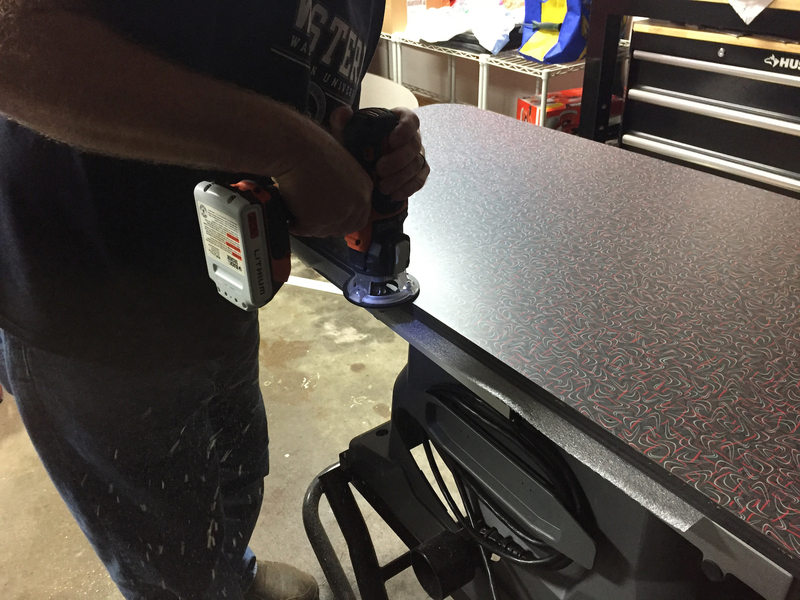 Today, Steven and Shannon helped me cut and apply two styles of WilsonArt “Retro Diner” laminate to the galley shelves, countertop and the dinette table. And I’m thankful for the help, because this job required six hands at times. This style is for the dinette table, which converts to the center berth base. I absolutely love this design. 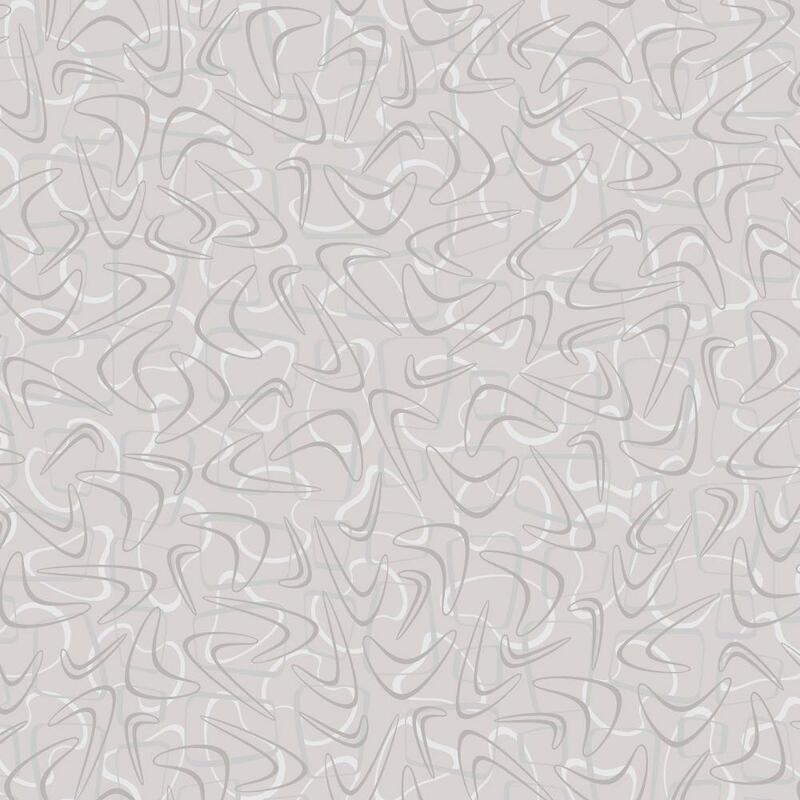 It reminds me of The Sixties, specifically the artwork in The Jetsons and later Mad Men. And this is the more demure style for the galley countertop and the double oven shelves. It’ll make my red appliances really pop. Note that the boomerang patterns are actually the same size. 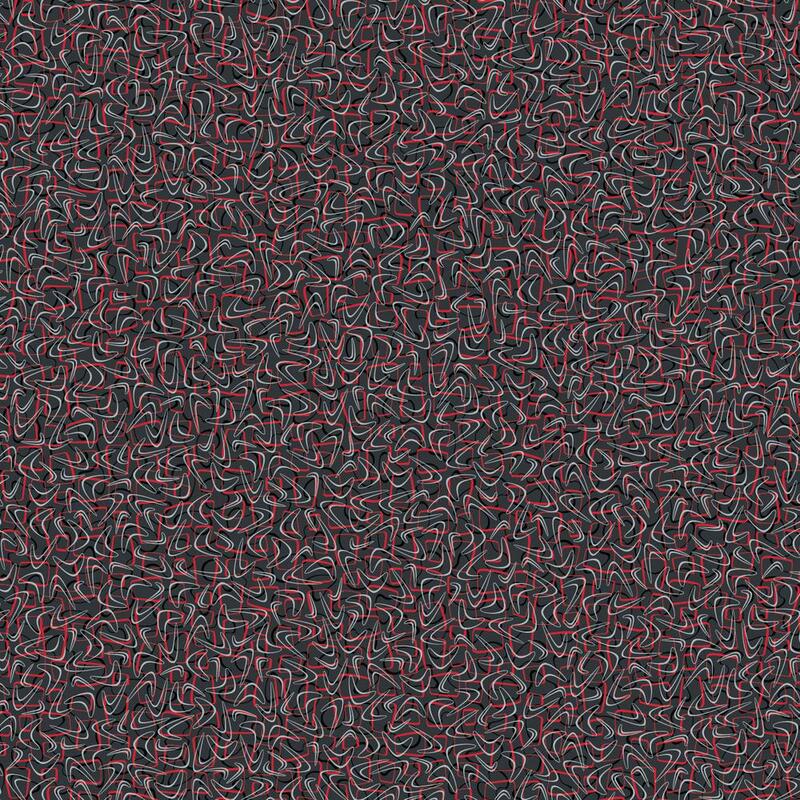 This gray one is just zoomed in. 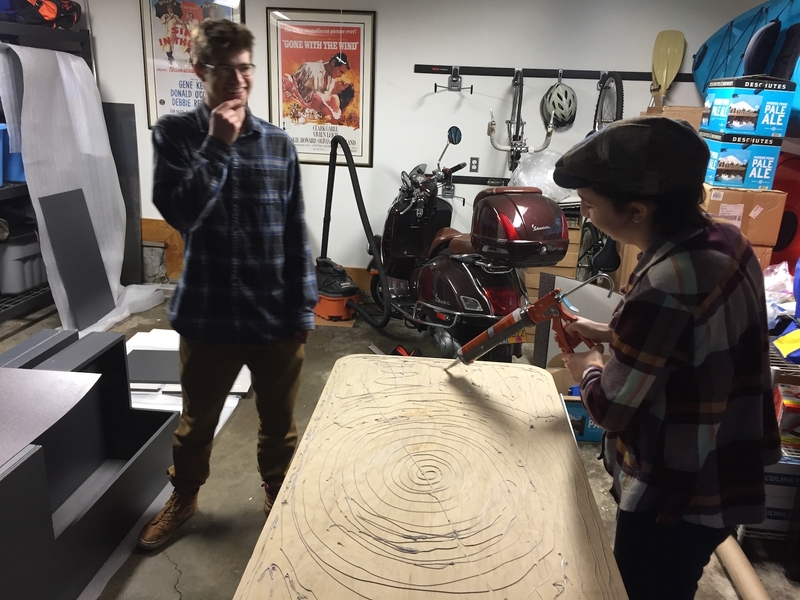 The first trick was learning how to properly support and cut the awkward 97×49″ sheets without damaging them. My jigsaw came with a Laminate blade but we quickly found that a thinner, finer Sheet Metal blade works much better. Even so, we had to discard two pieces due to crackage, but we had plenty of material to work with and still have some left over. We measured and cut each piece with at least 1/8″ of overhang. We used the berth base cabinets for support, forming a long cutting trough between them. Ideally a proper shop would have an 8×4-foot work table. But no, we used my Craftsman table saw stand as a portable work surface. The next challenge was how to trim the laminate overhanging the edges after the glue sets. For that, a trip to Harbor Freight in Tigard yielded a router bit that is designed just for this purpose. Some call it a laminate bit, and some call it a trim bit. But the cheap set I found just calls it a straight finish bit. The key feature is that the collar is on the bottom of the blades versus the top. That allows the collar to act as a guide, rolling along the finished wood without damaging it. 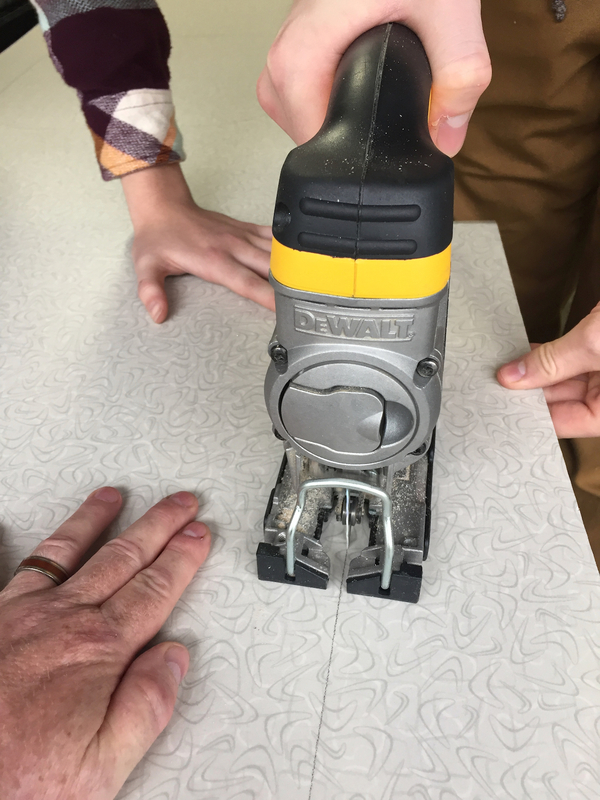 My Black+Decker 20V Matrix drill driver came with a small router attachment, and we were able to figure out how to the set the depth correctly so that the blade only cut the top 1/16″ of material — which in our case, is the overhanging laminate. By the time we got to the countertop we were experts. Even the sink cutout we traced looks professional. We left the dinette table top for last, and we didn’t bother jigsawing the rounded corners because the router proved it can handle that just fine. And it did. 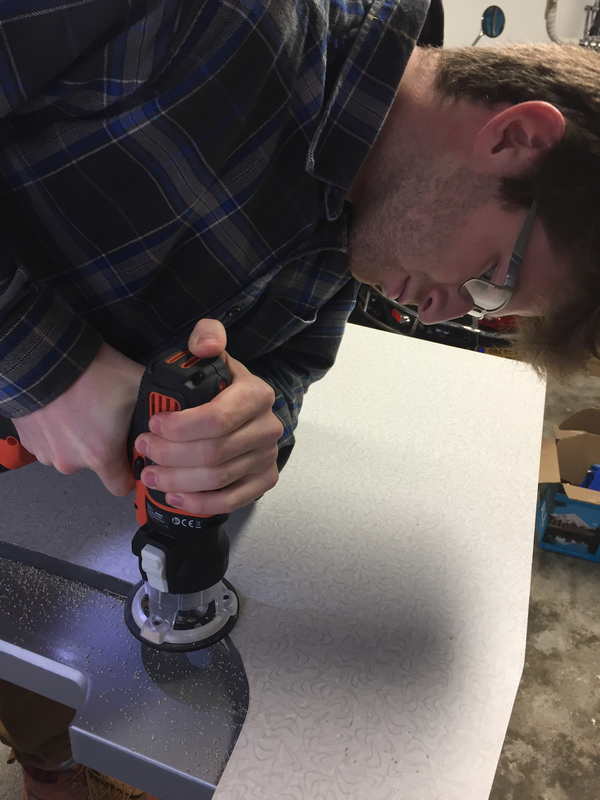 After routing the table top perimeter to trim it, we ran this special $40 slot cutter around the edge and formed the 1/2″ deep channel that will secure the chrome trim. It’s important to do this after the laminate is in place because that increases the thickness of the piece by almost 1/16″ (1/32″ plus the glue). 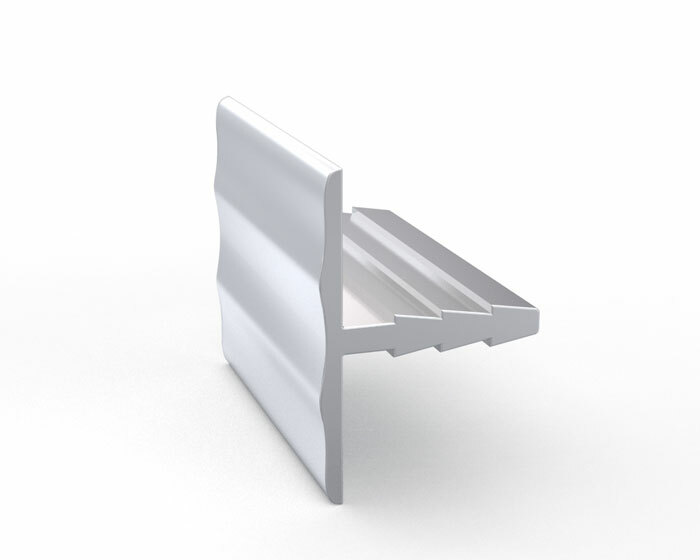 The chrome trim is 13/16″ tall by design, which matches the 3/4″ wood plus the 1/16″ laminate layer. 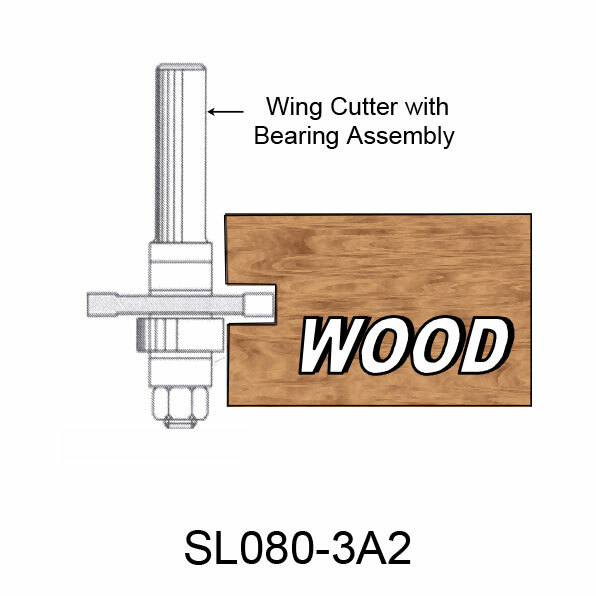 The special slot cutter is sold by the same company that makes the chrome trim (Eagle Aluminum in Minnesota), so the fit is virtually guaranteed.